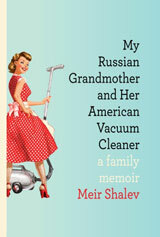 My Russian Grandmother and Her American Vacuum Cleaner by Meir Shalev caught my attention when I noticed it on a friend’s Goodreads list. Am I glad it did! The memoir is written by a man who was born in Nahalal, Isreal in 1948. I loved the delightful story about Shalev’s grandmother Tonia, a Russian immigrant who marched to the beat of a different drummer. Obsessive cleanliness ranked high on her list of priorities, and the telling of her life on a moshav and the vacuum from America is very funny and loving. I think the story is one most can relate to as it is about familial relationships and the embellishments which accompany the stories told by relatives about each other. Read this book. I highly recommend it. It is wonderful! This entry was posted in Uncategorized and tagged Books, Isreal, Meir Shalev, moshav, My Russian Grandmother and Her American Vacuum Cleaner, Nahlal, vacuum. Bookmark the permalink. Thank you for your comment! I really enjoyed this book. Let me know what you think when you do get to it! I just ordered it at the library. It sounds great. That’s why I follow your blog. Thanks for reading great books along with me Kathy! The author of the blog is coming to my local library (that’s how I stumbled to the blog post). Thanks for the wonderful additional information on the author! If you decide to attend the library presentation, I’d love it if you would share your impressions with fellow readers! Sounds like a fun read. I just requested This Is How It Was from the library. Thanks for your post! You can tell its been a long day…I meant to write My Russian Grandmother and Her American Vacuum Cleaner was requested from the library…that makes more sense! I’m with you Beth! Monday’s are tough no matter how you slice it! Enjoy the book and please let me know how you liked it when you are done! One of the most promising stories for the past week. I had too a grandma obsessed with cleaning. Thank you for your comment. It is a wonderful book. Perhaps we are all OCD in one form or another! I’m obsessive about reading! : ) My house, certainly not as clean as the author’s grandmothers!